Hum TV is all set to air the 5th Hum Awards 2017 today on 22nd July, 2017 at 7:00PM. The 5th Hum Awards 2017 is a fun filled event swelled with the thrilling performances of glittering celebrities. HUM TV has celebrated the 5th HUM Style Awards 2017 powered by PEL and QMobile on 29th April in a mega event. The 5th HUM Style Awards 2017 opened with the special tribute to Late Junaid Jamshed. Later on the event shower his entertainment with performances of glittering celebrities including Mehwish Hayat, Shahroz Sabzwari, Ahsan Khan, Asim Azhar with Momina Mustehsan Ali Sethi and Sajjad Ali, Kubra Khan. 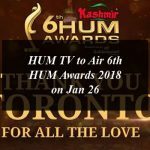 You can watch here the complete list of the nominations of the 5th Hum Awards 2017 here and the winners list here.